The 2018 SRT Dodge Demon Drag Strip Shakedown! - Muscle Cars Zone! The 2018 SRT Dodge Demon Drag Strip Shakedown! To be fair, we aren`t certain that this is the actual 2018 SRT Demon, since it`s lacking a lot of its specific features, but apparently a company representative for Dodge said that it was a Demon mule. However, that would be even better since that means that the real version is actually going to be much stronger. 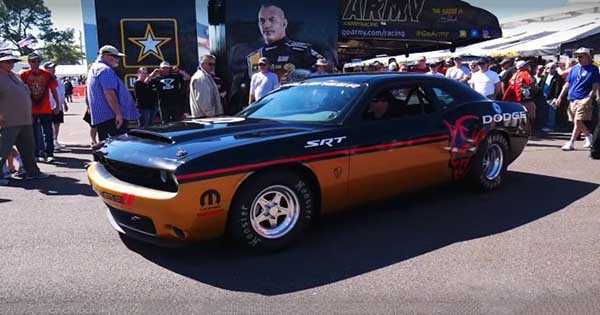 Either way, this version of Dodge`s newest beast is incredibly fast as well and it can rip across concrete like a possessed rocket. Maybe that`s where the name Demon comes from, as something this fast and powerful would be appropriate for a name like that. I love watching this amazing vehicle go as fast as possible, and the noise it generates makes you understandably expect a lot, concerning speed. Even if this isn`t a real version of the 2018 SRT Demon, it`s very likely that it has something to do with it since there has to be something there that connects it to the new Dodge. The car that rolled out on that race track, whatever it was, was really fast and it made short work of its competition. The car that was racing against this 2018 SRT Demon either fell asleep on the bell or just couldn`t hack it and couldn`t even keep up, let alone go fast enough to defeat this Dodge. While some wide body parts and a bunch of other noticeable traits are missing from this mule, this vehicle is still equally impressive and couldn`t be called anything except – powerful. At last, let`s give a first look to the new SRT Demon!